The last time I was in Europe visiting family, I noticed a new chain of shoe stores going by the name of Geox, had popped up everywhere - seemingly overnight. I went into one and snooped around to see what I could learn. All their shoes featured a new ‘innovative’ design shamelessly swiped from hobos: holes in the sole. 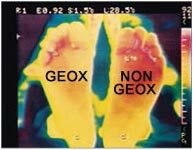 The result, as you can see from the thermal image above, is that Geox helps your feet to stay cooler and drier. In hindsight, I should have followed Peter Lynch’s principle of “use what you know”. But maybe it’s not too late. Geox is still a fairly small and unknown company with lots of room to grow. As well, they have recently added an apparel line using the same basic technology in their shoes. Here is their investor relations website, in case you are a fundymentalist. How is this different from shoes lined with Gore-tex? Nice chart btw, would be interesting to see one with shows also a year or so prior to the volume spike in Dec 05. Doh! Looks like they just got listed in Dec 2005..
Eyal, I’m not sure exactly what the difference is since they both make things that are supposed to ‘breathe’. Leaving aside the science, the difference for me is that being an Italian company, Geox knows design. And design, especially in clothing and shoes sells. 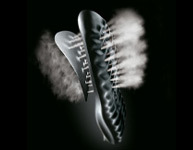 Most people buy Geox shoes because they look and feel great - the science of ‘breathability’ is just a nice bonus. Goretex stuff on the other hand is really ugly, hiking, mounteneering stuff.